This summer I was invited to the Travelling Homeopaths Collective Silver Jubilee Summer Camp, marking 25 years since Marcus Christo and colleagues embarked on their journey of providing a mobile homeopathy clinic at festivals and events. They have treated thousands of people for not only festival related acute disorders but also for chronic conditions, providing a great service and introducing countless people to homeopathy. This summer camp was different experience then I used to visit Charity camps before. 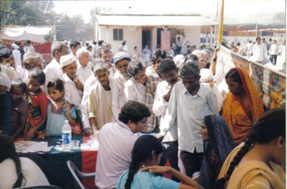 During my clinical practice in India, I was invited to several charity champs to check patients. I used to take small group of students enrolled for clinical training with me so that they can see more patients. All student homeopaths were always excited to join me because they learn to diagnose condition, develop observation skill, also quick symptomatic remedy selections & I believe it is very important for Homeopath. At Travelling Homeopaths summer camp I was not going to check patients. I was one of the 6 speakers; and we had 3 hours each which gave depth to the topics. The camp consisted of the main tent with the café next to it; tents were dotted around with the caravans and cars at the top of the field. The ambience was warm, cheerful and friendly with a definite holiday atmosphere even though 24 hours of lectures were taking place over 4 days. 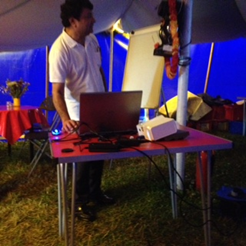 The lectures were held in the main tent, complete with tables and chairs, projector, and even a white board. The Vegetarian Café was run by Marcus’ wife Charlotte, serving delicious ‘home cooked’ fresh foods and an amazing range of hot and cold drinks. The facilities were great, I have never seen such amazing toilets, clean, hygienic with a solar light path, endless supply of toilet paper, and even decorations and a mirror. The hand sink was close by with ample water and soap – No baby wipes needed! One caravan was devoted to the shower with a wood -fire spacious sauna with seating and twinkling lights representing various star constellations. It was so clean and warm! 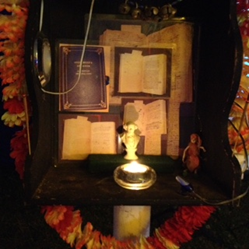 In Main Tent, Marcus always has Statue of Dr Samuel Hahnemann. I really liked it. My wife joined me to this summer camp. It was good to meet & to share knowledge with other Homeopath. We really thank Marcus Christo & his team for inviting us.